We have the equipment and expertise required to investigate and identify the root cause of Li-ion battery failures. detailed examination of specific areas with optical and electron microscopes. 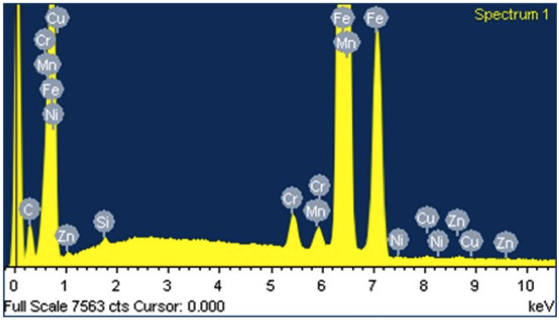 This can include elemental analysis by EDS if required. CT Scanning is a non-destructive x-ray technique that allows us to generate virtual cross sections through any part of a cell. CT scanning is an essential tool for cell failure analysis because it records the configuration and exact location of cell components prior to destructive analysis/disassembly. It can tell us where to look and what to look for during cell disassembly. Without a CT record vital information is easily overlooked. Opening of cells is done in a dry room. 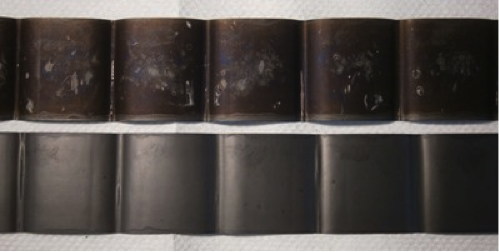 Lithiated graphite anodes deteriorate rapidly in moist air and can even burn spontaneously so a dry atmosphere environment is essential for careful examination of disassembled Li-ion cells. 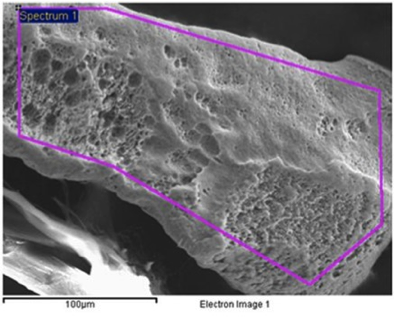 SEM (Scanning Electron Microscopy) allows detailed examination of small features, including elemental analysis. Example of a large impurity particle extracted from the cathode of a self-discharging cell. EDS analysis of the outlined area shows it consists of iron with a few % Cr and Mn. These are some typical methods but each investigation is unique. In complex situations additional testing or analytical techniques may be needed to understand the cause of failure.